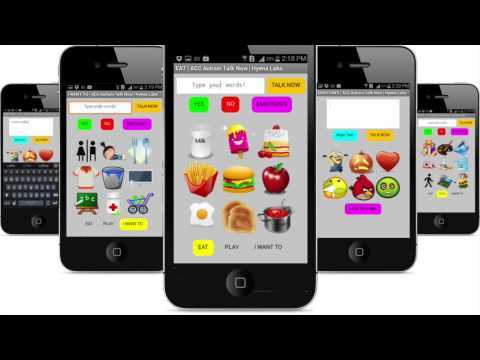 Check out your phone as Augmentative and Alternative Communication (AAC) device through AAC Autism Talk Now App. The AAC Autism Talk Now App is designed for non-verbal(toddlers) even the adults with the same difficulty. AAC Autism App builds a home of luxury in communicating the daily basic needs such as Eat, Play, I want To, emotions and gestures. Unlike thousands of other AAC Autism Apps, AAC Autism Talk Now App stands out with an excellent download and easy install options. This simple Autism device is stuffed with pictures, that speaks when tapped.Autism kids and adults always want to talk more. This is now possible through AAC Talk Now App. Let the AAC App simply speak out loud on what ever you type in the white space. Isn't it amazing! AAC Autism Talk Now is a wonderful learning App that makes every kid fill out with joy. Explore more by downloading AAC Talk Now App right on your device today. A wonderful App for kids to communicate their needs and show gestures and emotions. Also a learning App that educates kids with sound and images through visual cues.